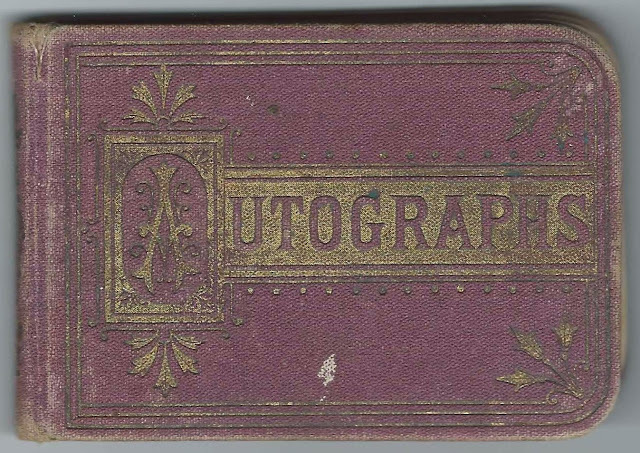 Autograph album presented to Annie Phillips of Amity, Oregon, by her brother R. W. Phillips at Christmas, December 25, 1878. The album continues through Annie's time at St. Helen's Hall at Portland, Oregon, and until August 16, 1895, when Annie, her husband Frank Bailey Ferguson and their two children are named on pages, although it appears that Frank inscribed the pages for his very young children. St. Helen's Hall, now known as Oregon Episcopal School, was founded in 1869 at Portland, Oregon, by Rev. Wistar Morris and his wife Hannah (Rodney) Morris; Hannah's sister Mary and three other women, all of whom had traveled to Oregon for the purpose of opening a school. I read that the group was so impressed with the sight of Mount St. Helen's that they decided on that name for their school. 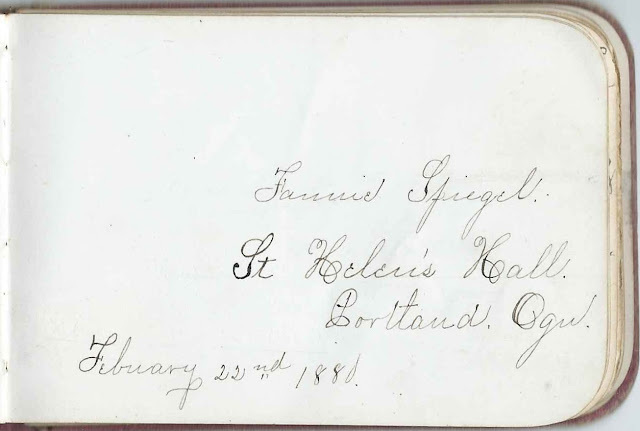 Many students at St. Helen's Hall inscribed pages in Annie's album in 1880 and 1881, including Fannie Spiegel, who inscribed her page on February 22, 1880. The album measures approximately 4" by 2-3/4" and contains the sentiments of 35 of Annie's relatives, friends and fellow students at St. Helen's Hall. An alphabetical surname list and an alphabetical list of the inscribers, together with any personal information they offered, appear at the end of this post. Annie's Find-a-Grave memorial indicates that she was born August 1, 1863 and died April 30, 1909. Her parents were Richard Wesley Phillips, a native of Alabama, who had come to Oregon by way of Louisiana, and Mary S. Hawley [Sophia or Sophronia], a native of Idaho. 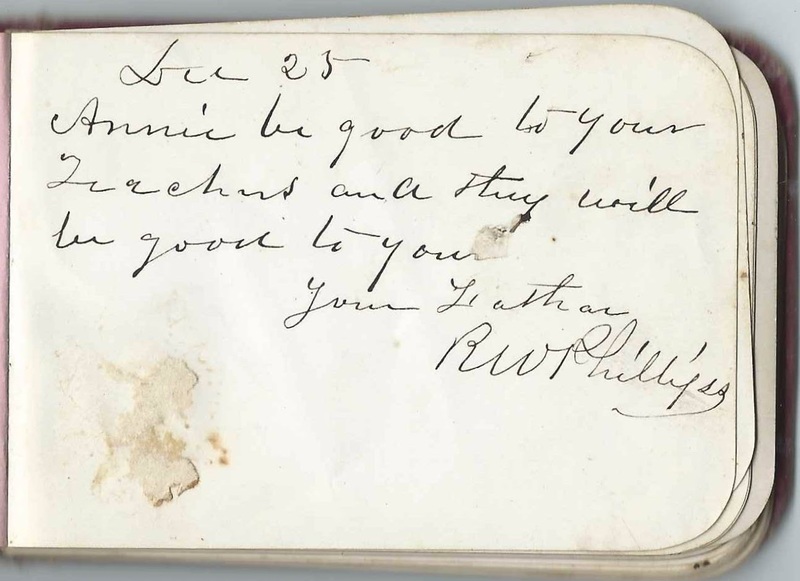 Annie's father Richard Wesley Phillips inscribed the last page in her album and wrote his inscription upside down. 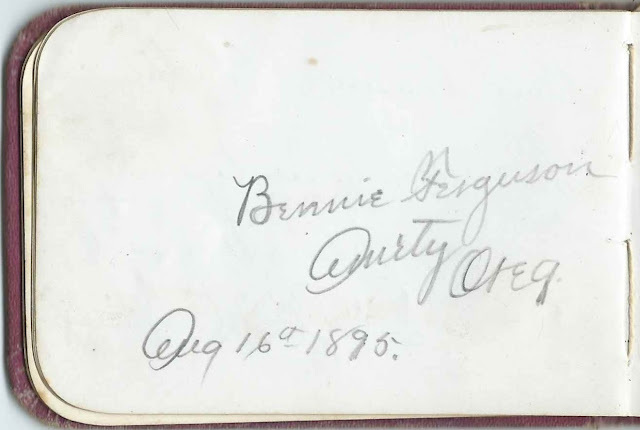 He dated his page December 25 but didn't give a year; presumably it was 1878, the year Annie received the album from her brother Richard Wesley Phillips, Jr.. Annie's mother, Sarah S. (Hawley) Phillips had died a few years before Annie received the album. Read more about Richard Wesley Phillips and his family, starting on page 596 in the Portrait and Biographical Record of the Willamette Valley, Oregon, published in 1903 by Chapman Publishing Company of Chicago. On May 15, 1890 in Yamhill County, Oregon, Annie E. Phillips married Franklin Bailey Ferguson. They had, I believe, two children. 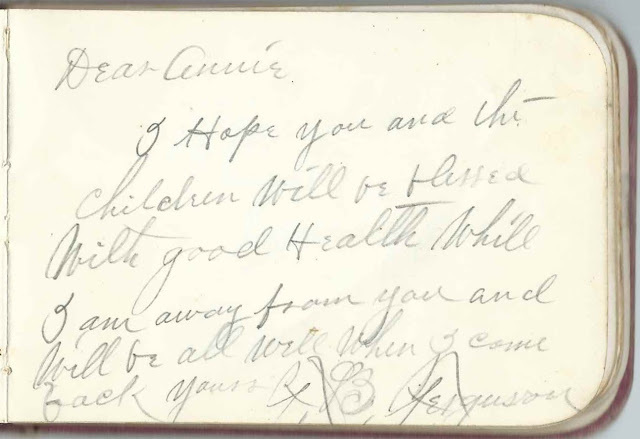 Frank inscribed a page when he apparently had to leave his wife and children for a time. The following pages, in page order, but they don't appear consecutively, inscribed on August 16, 1895, bear the names of Frank, Annie and their children Bennie and Mary, who would not have been able to inscribe the pages themselves in 1895. 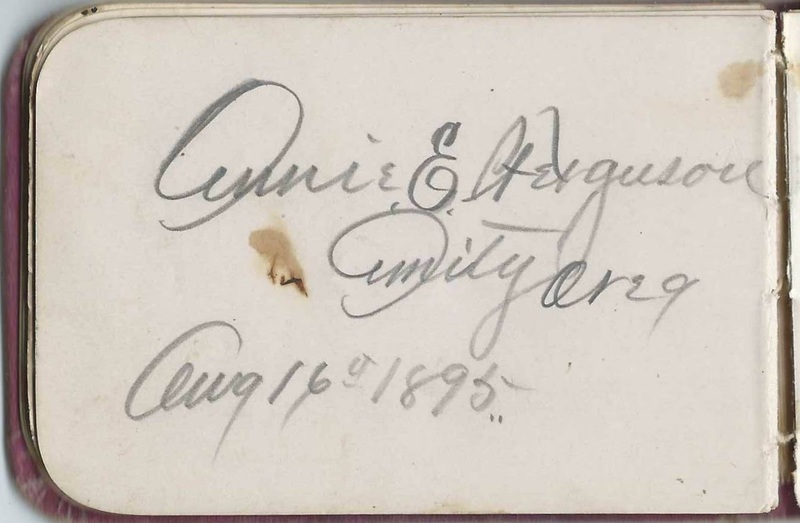 Judging from the handwriting, it was probably Frank who inscribed their pages, perhaps Annie's as well. 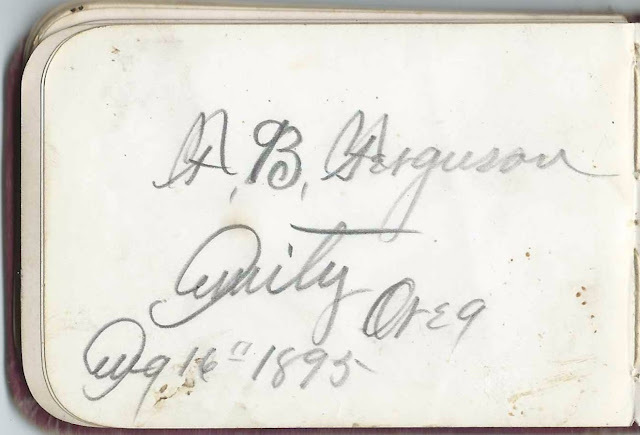 Annie E. (Phillips) Ferguson died in 1909 at Amity, Oregon, and is buried there in the Amity Cemetery. Frank married again and is buried with wife Blanche in the Mount Crest Abbey Mausoleum at Salem, Oregon. He died in 1931. Elvira Marshall of Portland Oregon. 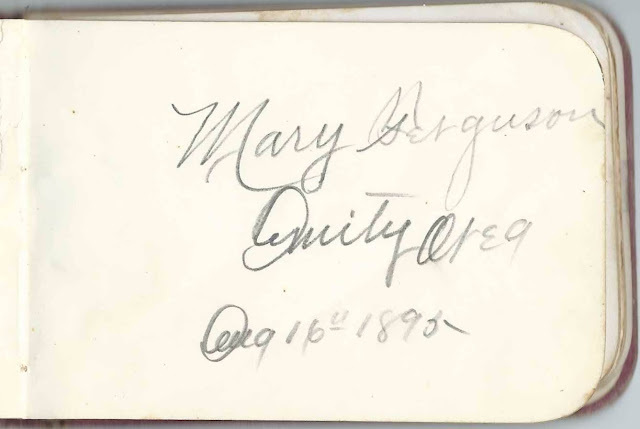 Maggie Marshall inscribed the left facing page. 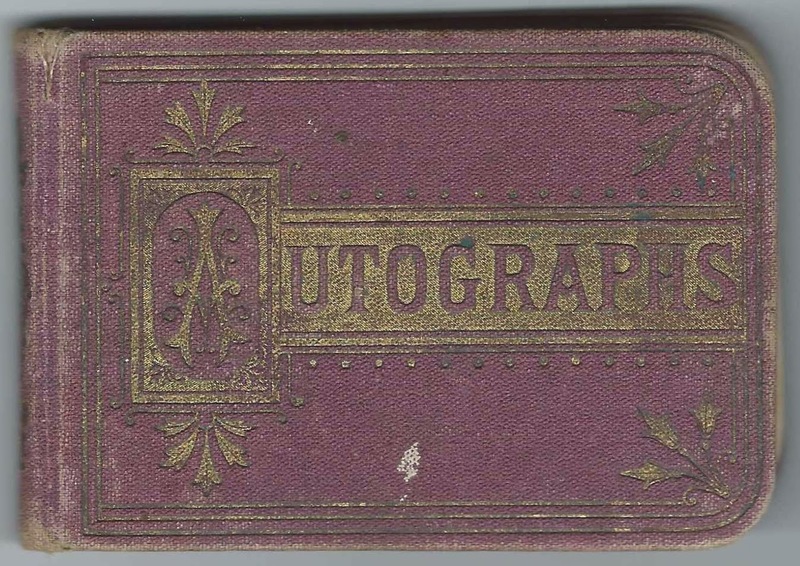 Maggie Marshall of Portland, Oregon; inscribed on February 23, 1881; Elvira Marshall inscribed the left facing page. Annie Phillips of Amity, Oregon, album owner; presented the album at Christmas in 1878 by her brother Richard Wesley Phillips, Jr.
R. W. Phillips presented the autograph album to his sister Annie on Christmas Day, December 25, 1878. He was Richard Wesley Phillips, Jr.
W. T. Phillips; Annie's cousin; inscribed on April 9, 1879. Presumably William Thomas Phillips, son of George W. Phillips, who was a brother to Richard Wesley Phillips, Annie's father. William would die in 1885. Oscar Phillips of Amity, Oregon. Oscar was presumably the son of George W. Phillips, a brother to Richard Wesley Phillips, father of album owner Annie E. Phillips. Mary J. Phillips; Annie's aunt; inscribed on April 13, 1879. Presumably Mary J. (Ladd) Phillips, wife of George W. Phillips, who was a brother to Richard Wesley Phillips, father of album owner Annie E. Phillips. 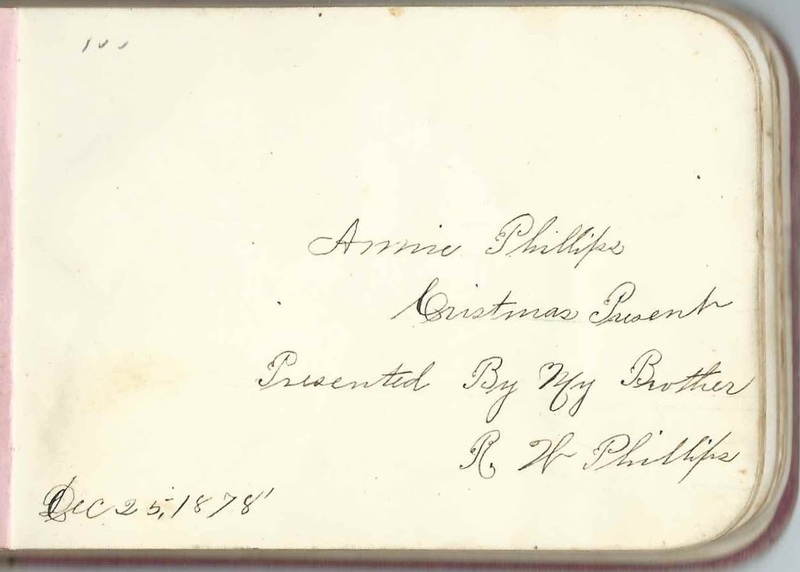 Written upside down: Annie's father R. W. Phillips, who inscribed a page on December 25, perhaps December 25, 1878, the day that Annie received the album from her brother R. W. Phillips. Richard Wesley Phillips, Sr.